Thank you everyone for making last Thursday’s show so much fun. I was worried that the flooding and holidays would keep people away but the place was packed and we had a night of great stories. Thank you also for letting me take some time and work on a story of my own one final time before putting it to rest. It takes me a long time to write my own stories and it was nice to finally close the book on that particular one. I hope everyone who showed up enjoyed our special guest Launa who closed the show. Her story was just as captivating live as it was on the radio. I hope to have more special guests in the future. I’ll put a link to Launa’s story on our Facebook page in a few days. Special thinks to our first-timers Scott and Miz James. If you ever have a chance to work for Scott do it! He is the world’s kindest boss. Miz James’ story had a number of themes in it but the one I’m still smiling about three days later is the power that certain Bollywood film stars have over the rest of us mortals. When I was a kid I wanted to be Spiderman. Now I want to be Shah Rukh Khan. Obie told a beautiful story about the freedoms some of us have and some of us don’t. It’s something we’re all thinking about a lot these days but they way Obie’s story played out was unique to him. All I can say is that every time I see a political bumper sticker I will think of that story. Terra Lea is one of our newer storytellers who I hope will become a regular. She had one of the best opening lines ever and I am going to do everything I can to convince her to let me put the audio online. It’s a sweet story about facing the difficult things in life and how sometimes the best way to do that is by taking your pants off. Special thanks to everyone who told a story that night: Ginger, Barb, Bailey, David, Jonathan, Miz James, Obie, Scott, Terra Lea, Launa. Once again I feel bad that I had to bump a bunch of people because we ran out of time. I’m trying to think of the best way to get as many people onstage as possible and it basically comes down to a two things. One is that all of us need to stay under the 8 minute time limit. I know it’s hard to cut stuff but for FGS we really need it to keep it tight. The other is that I’ll probably start keeping a list of who tells a story on which nights so if it comes down to choosing someone who told a story last month and someone we haven’t seen in a while I’ll choose the person we haven’t seen for a while. We have a lot of regulars who tell great stories but some folks take months to work up the courage to get onstage and I want to make sure they get a chance to share their story. One thing that I know will be helpful to everyone is a new story workshop that Bill Bernat is starting up. 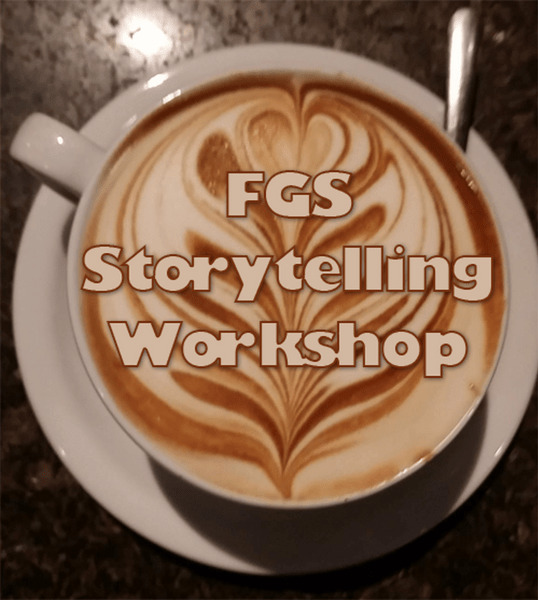 He’s going to hold one workshop a couple weeks before each new FGS so if you’re working on a story and you want some help on it this is a great place to go. It’s free and run by one of the best storytellers I know. Next month we’ll be going to back to our regular non-holiday schedule which is the 4th Thursday of every month. That means our next show is January 28. The theme is “Starting Over.” I’ll write up the official invite next week and get that out to you. Let me know if you have any questions.